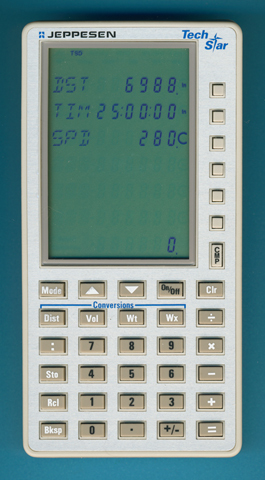 Size: 5.3" x 2.9" x 0.35"
This Jeppesen Sanderson Techstar is not related to Texas Instruments! And the base of this sophisticated Flight computer introduced in 1992? It is an original design heavily influenced by the famous Financial Investment Analyst FIA-10 introduced 1989. Already in 1978 the Heathkit OCW-1401 defined the first non-calculator based Flight computer.